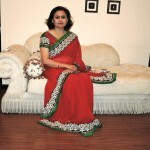 100sareepact | Saree designed by me! Back in the pact after two weeks! Due to various reasons couldn’t drape a saree all these days. Yesterday husband & I went for a long drive and stopped to take a few pictures before the sun went down. Influenced by all you beautiful ladies wearing checks sarees, I designed this saree. Took five days to stitch this saree, with my tailor taking another week to make this blouse, here is my creation.